must be I'm not a geek. This one certainly has me thinking. Methinks I willbhavevtobtalk to my son-in-law about it...maybe he can explain it to me. LOL, it is a LINUX joke. I'll try it on one of my computer buds. Look up faulty towers for the context. Ok...I understand it now. Good one mate. You must have the right syntax or it ain't gonna work. Ubuntu spoken here. Suz! 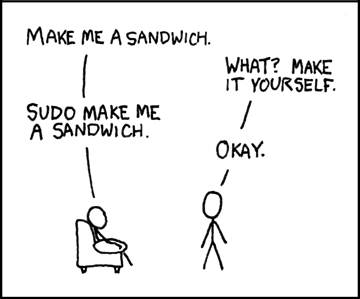 I think I SUDO love you!